ROAD TOWN, Tortola, VI- The Virgin Islands own Norville S. ‘Banana’ Carey became the latest in a growing line of Professional Basketballers from the Territory when he made his debut for his Dutch club, the New Heroes against Weert Basketball Academy on Tuesday October 10, 2017. Carey and his new club gained their first competitive win of the season in the Dutch Basketball League, 81-63, partly due to a good 2nd quarter (5-25) and a hard-playing Nick Oudendag (double-double with 24 points and 13 rebounds). 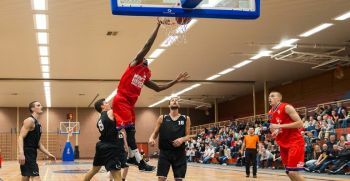 After the opening ceremony, Weert took over the lead with a three pointer from Aarts and then failed to capitalise on a couple free throw chances, allowing New Heroes to take a slender 2-4 lead. Weert pulled ahead again, though at 10-6. Poropat took a time out and not 10 seconds later, it was Marshall who put his first points on the board for New Heroes. Weert was still on the right side of the score with 10-9 and Gorrison made it 12-9, before the New Heroes got something back by Norville Carey, to make it 12-11, but Weert hit again from long range to make it 15-11. However, with 3.44 on the clock it was Carey again scoring to reduce the gap to 15-13. After another spurt from Weert, the New Heroes again came back strong to make it 21-16 at the buzzer. New Heroes began the 2nd quarter on fire with a 0-12 run giving them the lead at 21-28. Carey, Bleeker with a dunk, Bleeker and de Vries with a triple and Oudendag all scored and another 7-point run saw New Heroes up 24-35 and as they now had complete control of the ball, reached half time leading 26-41. Further strong play during the third quarter dented any hopes that Weert had of getting to close the score and by the end the score was 42-60. The 4th quarter was a little closer with Weert giving a good account of themselves and by halfway through were just 11 points behind, but with 3 minutes left New Heroes were back up by 17 and with both teams missing opportunities the final score was 81-63. Carey finished with 17 minutes on court, going 4 of 9 from the field, picked off 4 rebounds, made 2 steals and finished with 8 points. Next up for the New Heroes is the first home match of the season against "newcomer" Den Helder Suns, on Sunday October 15, 2017.